This all new handbook is the most comprehensive and authoritative reference available on CNC machining centers and their capabilities, commonly used CNC commands, and CNC related tooling for the production of precision machined components. 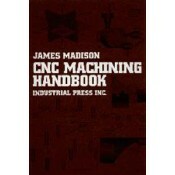 Written for programmers, engineers, and operators, it provides a ready reference for basic theory, production data, and machining procedure. Both apprentices and experienced operators and programmers will find this invaluable reference an essential source for all their needs. • Analyzes entire machining systems while covering milling, boring, turning, grinding, and related CNC tooling. • References individual CNC commands by graphical representation of the toolpath and the surfaces produced. • Every generic command is cross-referenced by industry standard CNC machine formats and illustrated by the surface, machine movement, or toolpath that results from using the individual commands. • Allows users of precision machining centers and high-rate material removal systems to become better and more successful programmers.